Imagine I ask you to write your name down on a piece of paper. You are completely competent to do this; indeed, you will be an expert. So if this were to be done in front of a peer or a panel of judges I doubt it would raise your heart rate significantly. There would be no sweat on your brow. You have done it thousands of times; it requires almost zero conscious effort. You are competent. What about a crown preparation? Applying the very same standard, do you feel competent? Would you deliver an ID block, choose your burrs and then prepare a lower seven in front of a group of dentists who are there solely for the purpose of watching you work? It’s always flattering when I’m asked to treat another dentist and more so when a dentist asks me to treat their loved ones. I teach that the standard of competence, the one I believe is acceptable, is that we are happy to perform any given clinical procedure in public and under close scrutiny. However, to be honest, that isn’t the point of this blog. Those dentists who asked me to work on them or their families have flattered me no more than by saying, “I believe you to be competent”. And flattered I am. However, I also have learnt a lot about teaching during these encounters. The first relates to an onlay preparation on a LL7 for the fiancé of a dentist I work with occasionally and whom I have trained on a regular basis for the last year. He has cracked cusp syndrome in this tooth as it is heavily involved in lateral guidance and has lost its distal marginal ridge. Again, the clinical pathway and procedure isn’t the point here. We finished, and I was surprised to see the dentist almost upset. My surprise came from the fact that I have been through all this information several times with this person, albeit never a live demonstration on a real human with whom she had promised to spend the rest of her life. There had been lectures, phantom head demonstrations, revision, reading lists, ‘likely problems you may encounter’ discussions, etc. She acted like this was all almost new. Two weeks later I was in a similar situation, on an upper tooth this time, treating a dentist whose husband, also a dentist, wanted to nurse whilst I worked. The baffling situation at the end was that he had almost no recollection of the procedure despite watching it from point-blank range and my running commentary on every spin of the burr. He even asked questions mid procedure and repeated them when we had finished, as if the previous conversation had been a fleeting dream from the night before. So with two almost identical educational experiences we have grossly different learning experiences and outcomes. For one it is a life-enhancing moment which will forever give her a rock-solid foundation to build on and enjoy developing and using at work. The other a seemingly ephemeral moment with as much educational value as an episode of Love Island. None. This was all a few years ago . I had already completed my educational degree and considered myself a pretty good teacher if I’m honest… but this… I wanted to discuss it with my educationalist supervisor – a true genius of education. So we talked it through, based around the cartoon above. People learn in different ways. Some people love the vague, intuitive base principles, which they then ponder and develop in their own time. For them it may be the only way it sticks. Others want a literal A, B, C, list of how to’s along with a clear explanation of why, but this list is the main point. Both are equally valid and both can result in excellent clinical care and outcomes for patients. Equal but different, like us all I guess. 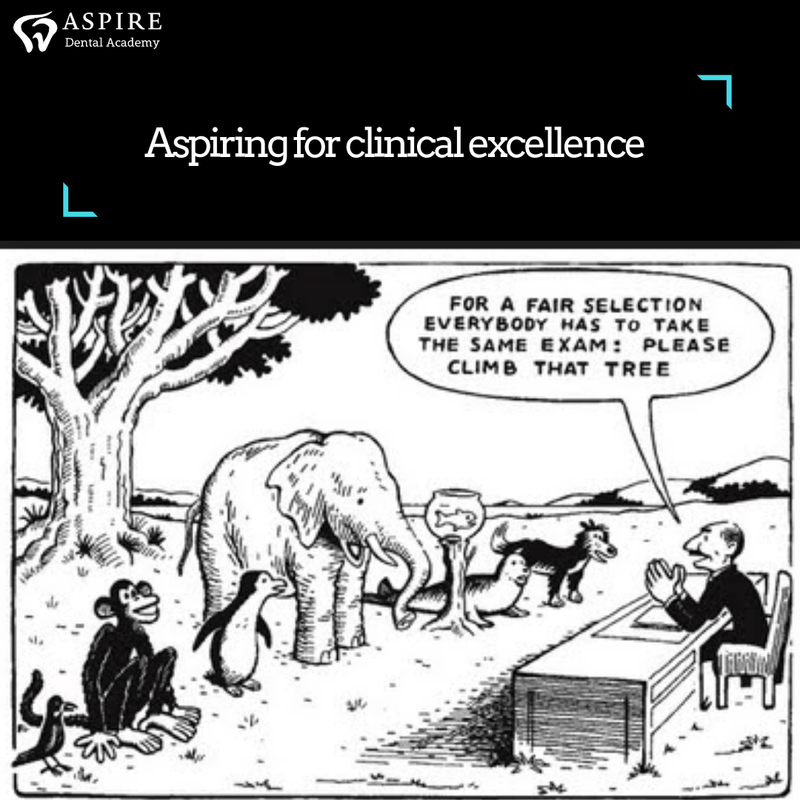 Either way, as someone who provides and now sells a lot of educational opportunities, I know everyone has their own path to clinical excellence. Part of the fun is in finding yours and enjoying the journey. Certainly the destination is a good place to be, whichever route each of you chooses to take.